Add the safety and convenience of a hands-free Bluetooth kit to your vehicles factory stereo with the BluStream. The Blu Stream is an add on Bluetooth module for the GateWay that lets you receive or place calls through your radio. Additionally, the BluStream can be used to play music from your iTouch/iPhone 3G, or iPhone 3GS, through your car's sound system, so you'll never miss a beat. The BluStream is designed to offer compatibility with all models of iPhone. and iPod's with Bluetooth for use with iPhone, And most Android phones. 1st Generation iPhone does not support A2DP Streaming Audio. Must be used in conjunction with the GateWay aux or iPod interface. 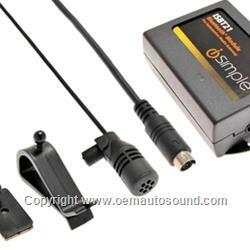 You must be using the PXAMG in satellite radio emulation mode in order to use the ISBT21. All PXAMG modules with a revision lower than 778b must be updated with the latest firmware to be compatible with the ISBT21. Does not support phone book download. With the exception of PGHGM1 applications, you MUST be in satellite radio mode to make receive phone calls. If you are in any other mode the ISBT21 will automatically disconnect from the iPhone and will not function. Pair up to 8 phones. Separate microphone, hands free, ringer & A2DP volume adjust.